See how the RYOBI Nation Dream Workshop maximizes space with this DIY Murphy Worktable. 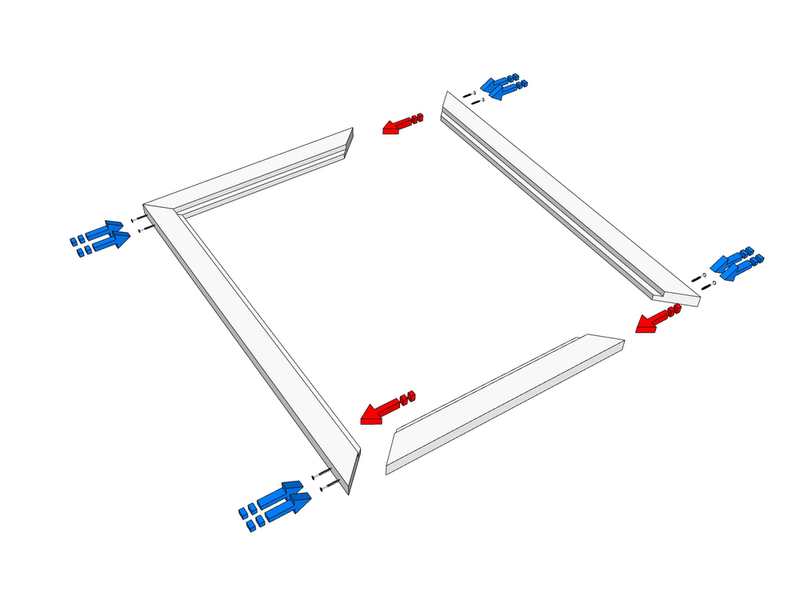 Check out the features of this sturdy solution that folds easily onto a wall-mounted frame. 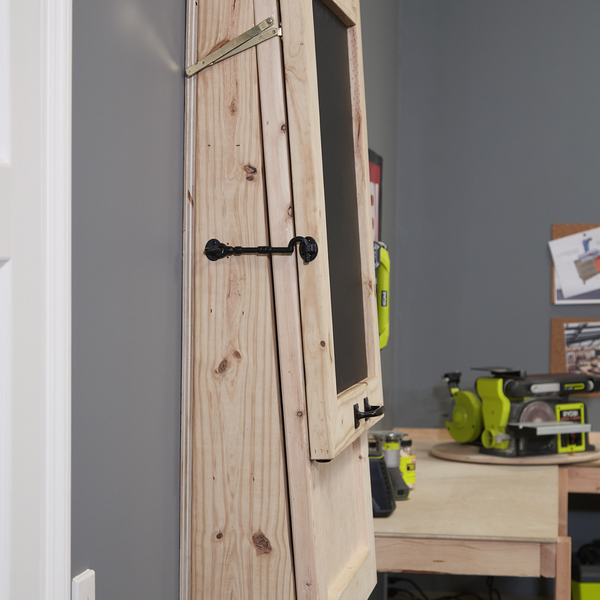 Download the plans and start turning your space into your own Dream Workshop. 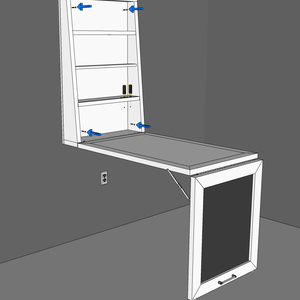 Start by constructing the sides of the cabinet. Square off the edges of two 2x8s cut 45-1/2” long. 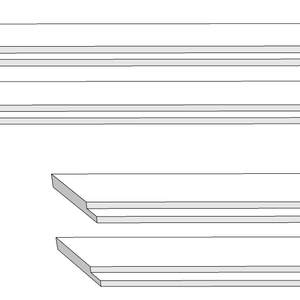 Next, make an angled cut so the top of each board starts at 3-1/4” deep then tapers down to the corner of the 2x8. 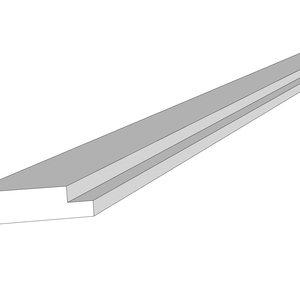 Next, from the remaining milled 2x8 material, cut a piece 30” long. 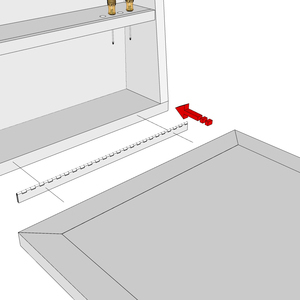 Make an angled cut along the length of the board to match the angle and depth of the cabinet sides. 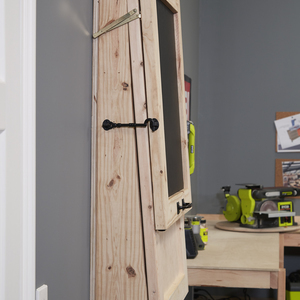 Drill pilot holes and attach top to cabinet sides with (4) 2-1/2” screws. 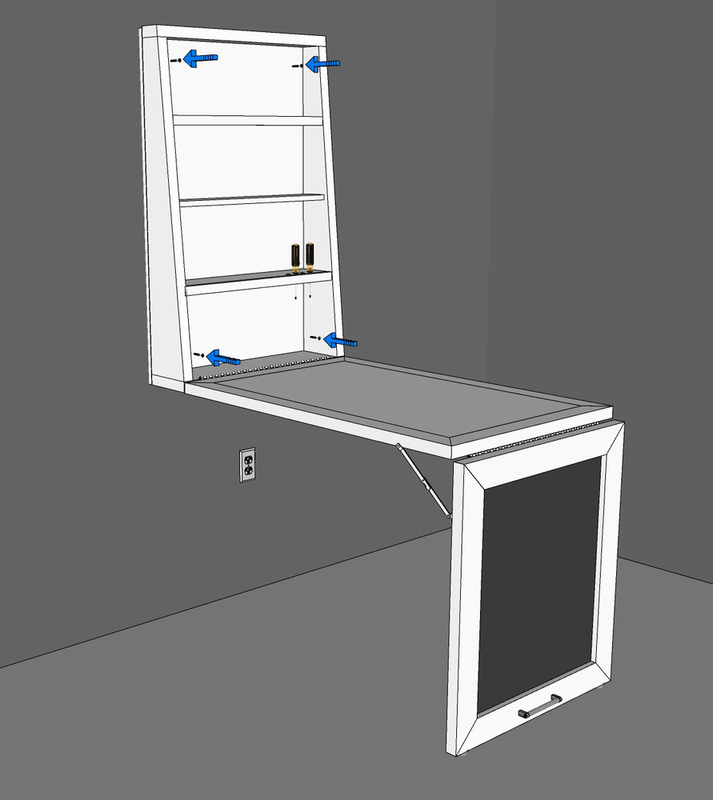 To make the cabinet base, square off a 2x8 cut 30” long and attach with (4) 2-1/2” screws. 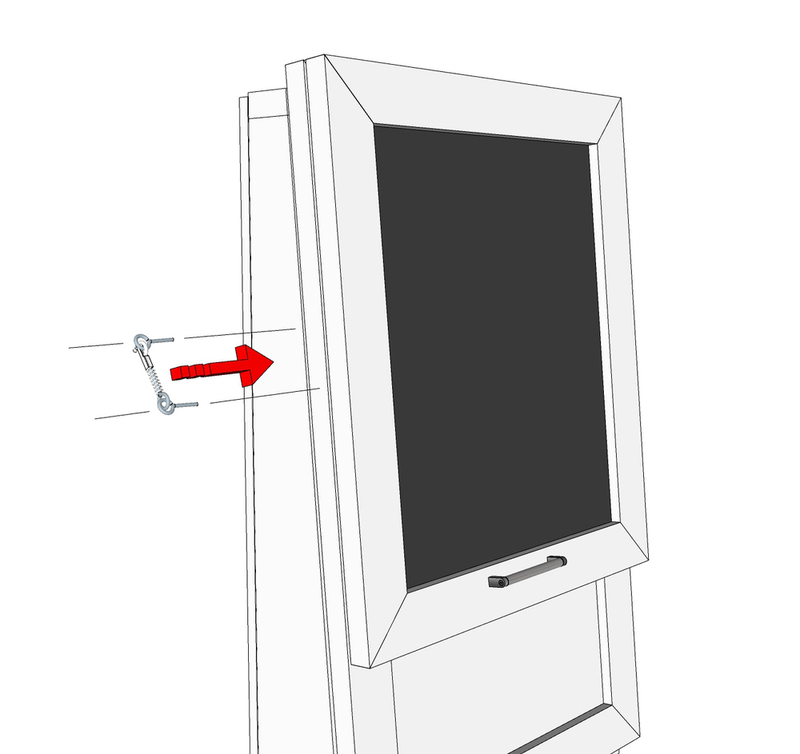 Attach back of cabinet with wood glue and 1-1/2” screws. 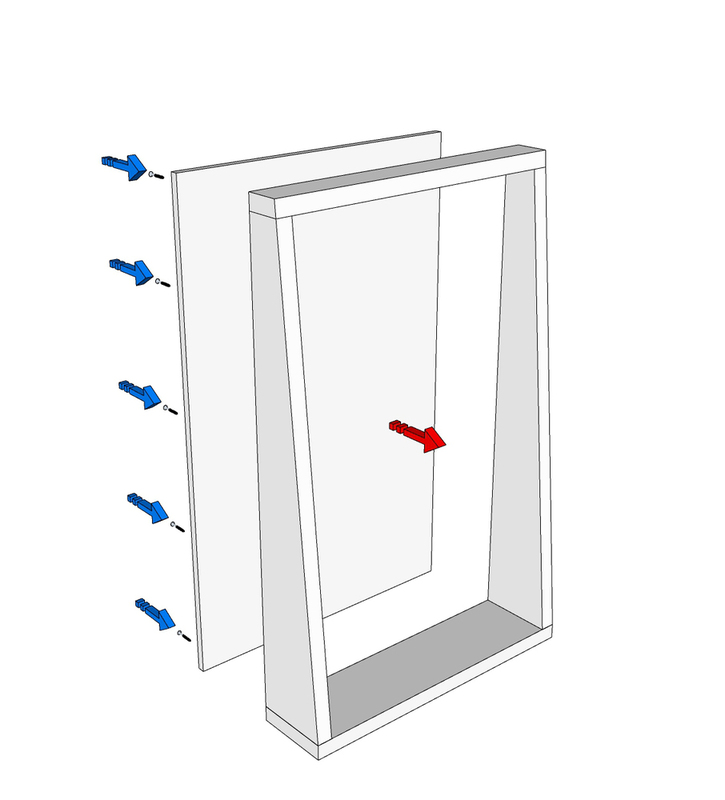 Measure the inside width of cabinet and use that measurement for the width of the shelves. 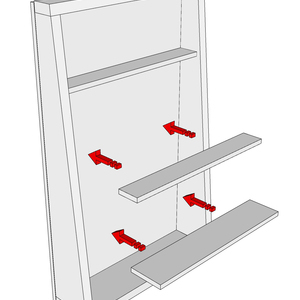 To calculate the shelf depth, measure the depth of the cabinet at the desired placement of the shelf and subtract 3/4”. 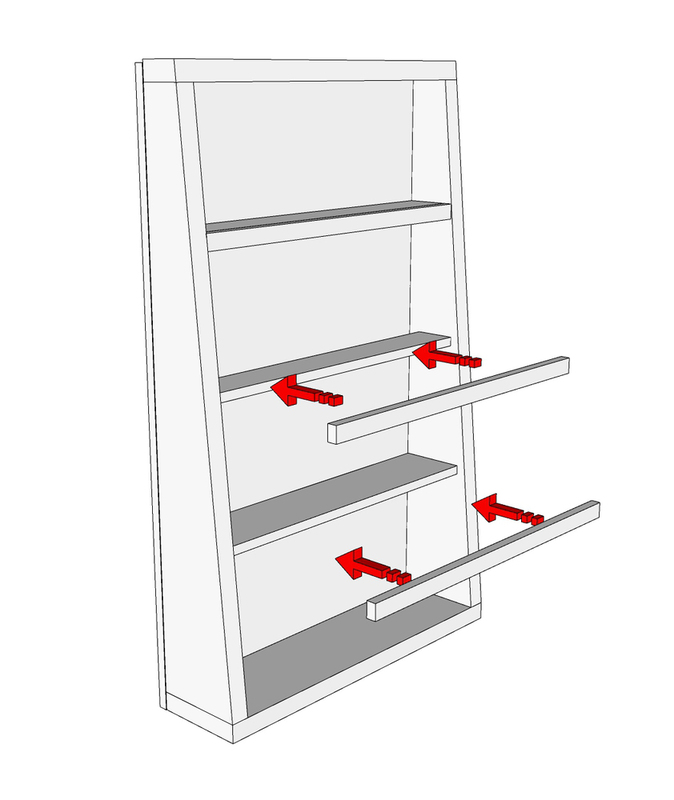 This will ensure the front of the shelf is flush with the tapered edge of the cabinet sides once the face trim is attached. 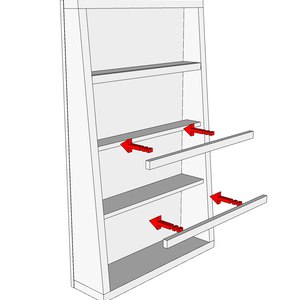 Cut the desired number of shelves from 3/4” plywood. 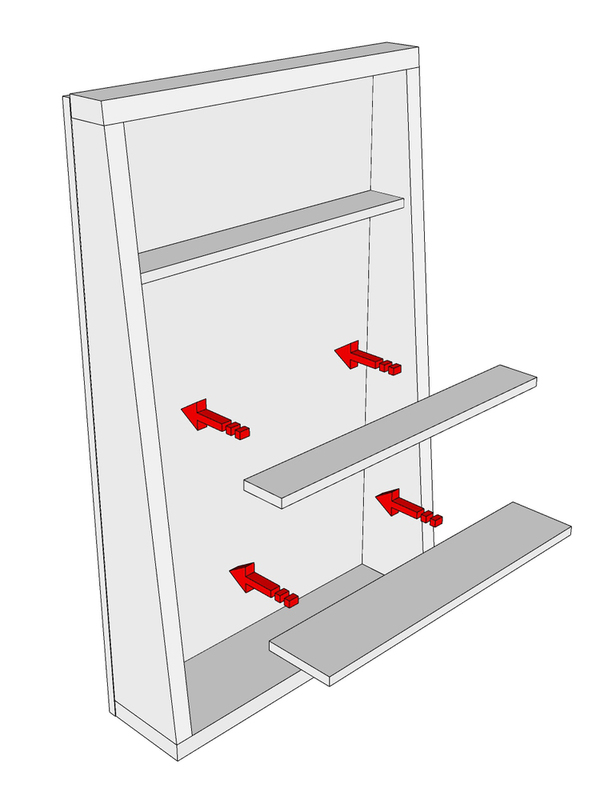 Apply glue to the back and sides of each shelf and screw from back and sides with 2-1/2” screws. To construct the work table, start by squaring off the edges of 2x4 boards and cut a rabbet groove 3/4” wide and 3/4” deep along the entire length of the boards. This rabbet will accept the plywood table top. Next, trim out the table top like a picture frame. Using a miter saw set to 45 degrees and cut two boards 48” long and two boards 30” long. 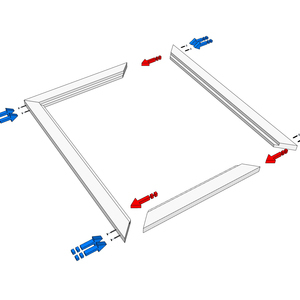 Lay out each side of the table frame. Drill pilot holes through the sides of the frame. 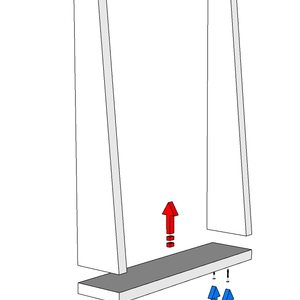 Apply glue to the miter cuts and fasten the frame together using 3-1/2” screws. 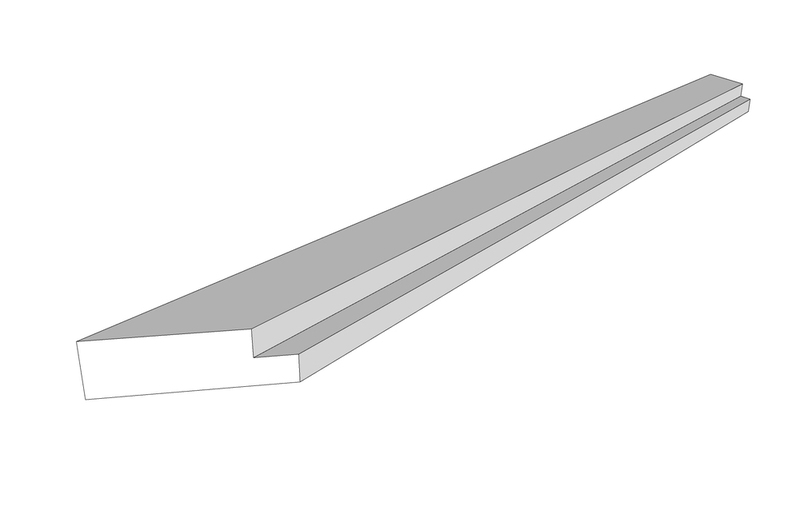 Measure the length and width from the outer edge of rabbet cut in the frame and use that measurement to cut table top from 3/4” plywood. Apply glue inside rabbet cut. 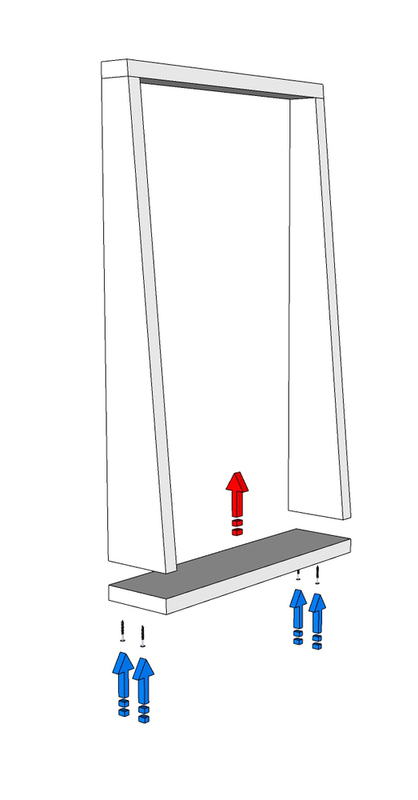 The table top should fit flush inside of the frame. Fasten to the frame using 1-1/4” brad nails. 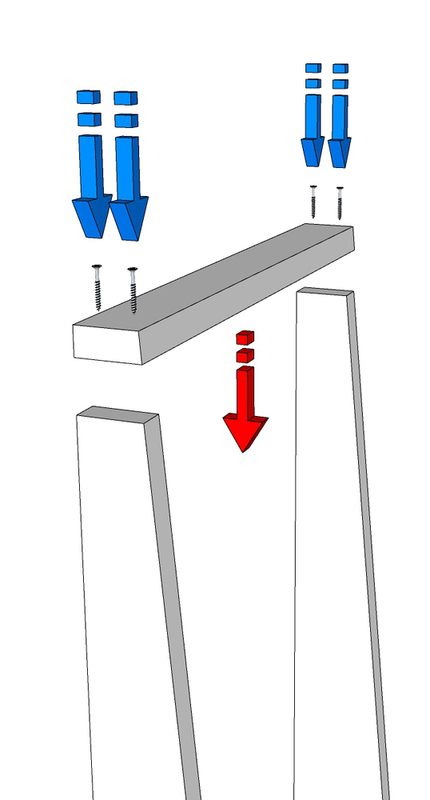 To construct the table legs, start by squaring off the edges of 2x4 boards and cut a rabbet groove 3/4” wide and 3/4” deep along the entire length of the boards. This rabbet will accept the plywood inlay. 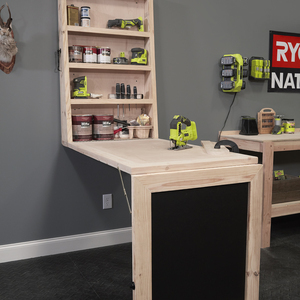 Next, trim out the table leg like a picture frame. Using a miter saw set to 45 degrees, cut two boards 34-1/4” long and two boards 30” long. 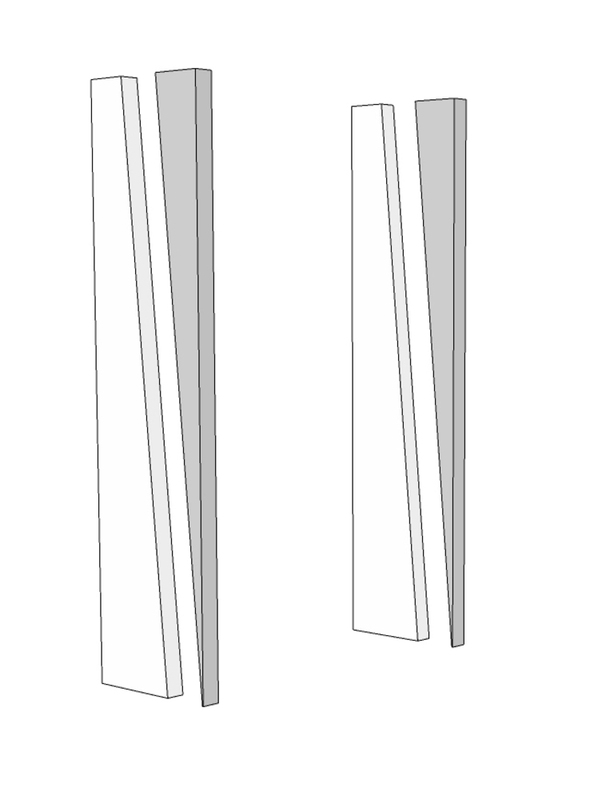 Layout each side of the leg frame. Drill pilot holes through the sides of the frame. 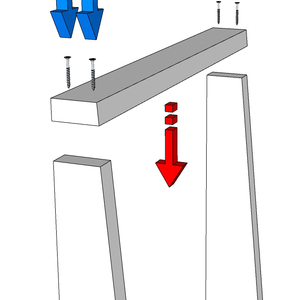 Apply glue to the miter cuts and fasten the frame together using 3-1/2” screws. 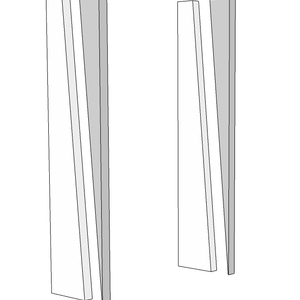 Measure the length and width from the outer edge of rabbet cut in the frame and use that measurement to cut the leg inset from 3/4” plywood. Apply glue inside rabbet cut. 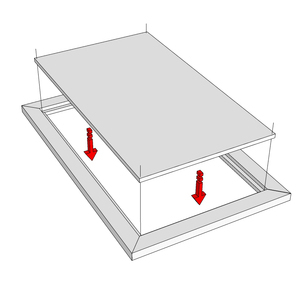 The leg inset should fit flush inside the frame. Fasten to the frame using 1-1/4” brad nails. 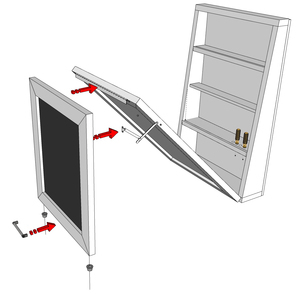 Attach the table to the cabinet with piano hinge as instructed by the manufacturer. 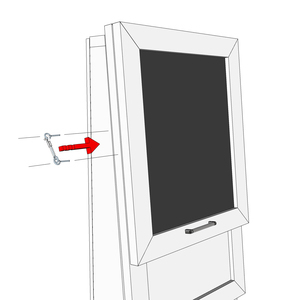 Attach leg to the table with piano hinge and both right and left lid support hinge as instructed by the manufacturer. Attach pull handle to bottom of leg. 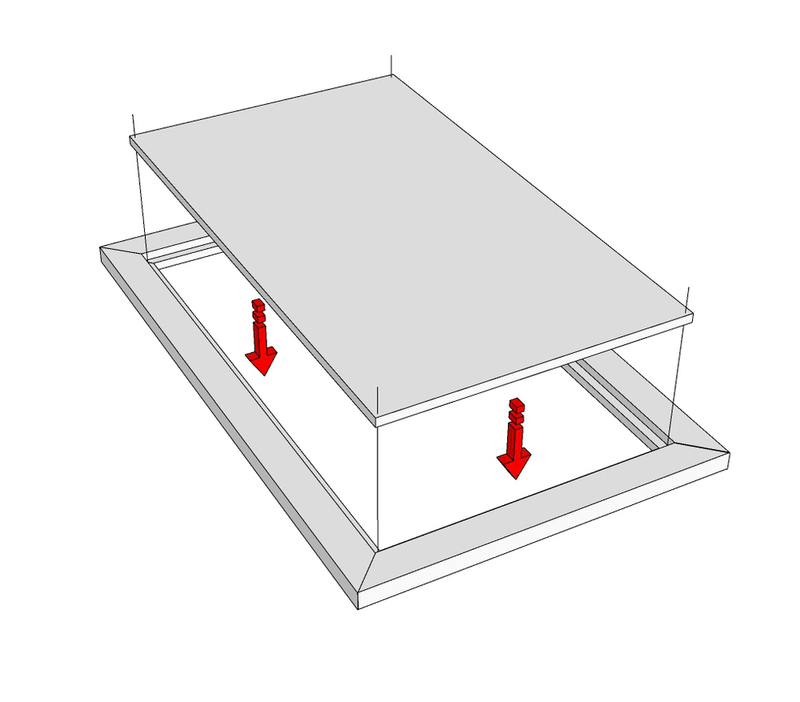 Attach rubber surface pad to bottom of table leg. 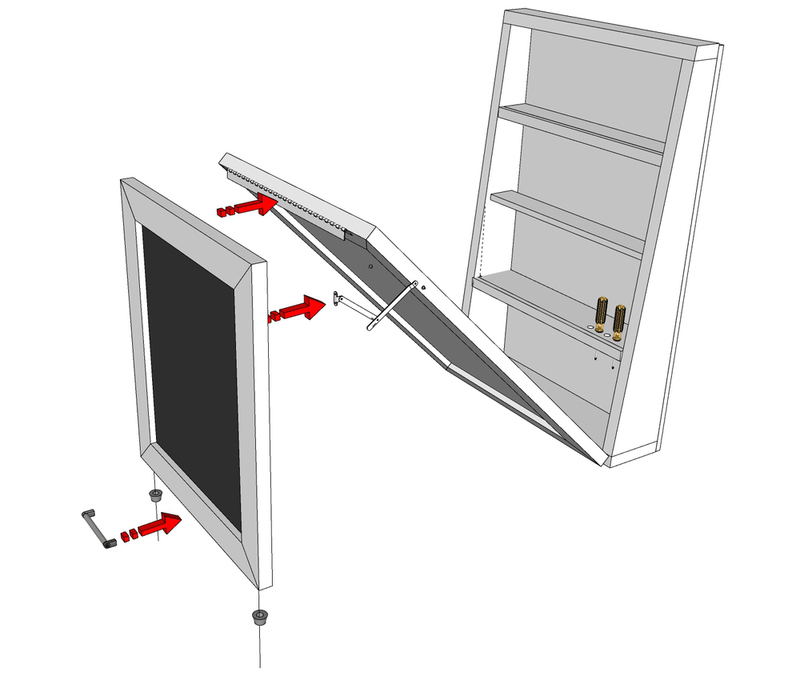 For safety, install 6” black hook and eye latch, or other hardware to lock the table to the cabinet. 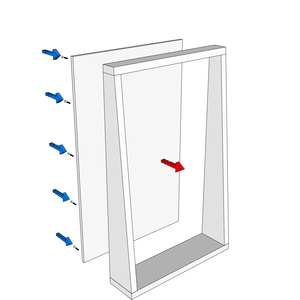 Locate studs in wall and hang completed cabinet to the wall by driving (6) 2-7/8” Headlok screws through the back of the cabinet into the wall’s studs.